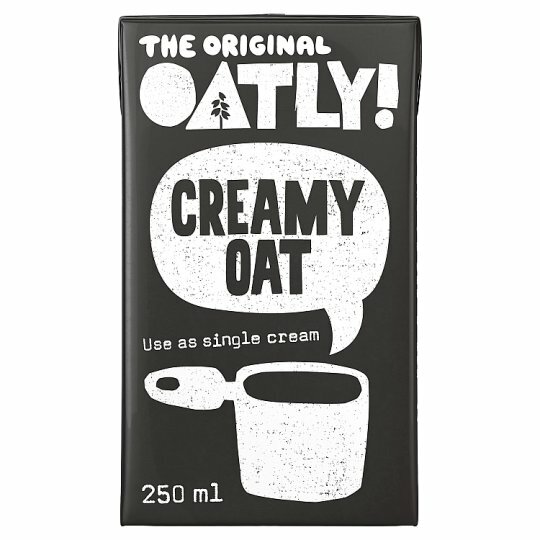 Creamy oat - oat based alternative to single cream. If this product could have a slogan, it would go something like this: “Now everyone can enjoy the same sauce.” What do you think about that line? You are probably unconvinced by the crafty choice of words by the writer, so think of it like this: A bunch of friends or family members all sit down to dinner. One is lactose intolerant, two are vegetarian, one is vegan, one loves meat and the other doesn't want anything to do with anything that comes from a cow. What do you do, make four different dishes? Exactly, imagine if there was a cooking cream that didn't contain cream but that tasted just like it and could make things easier for you when you are aiming to please your guests who haven't found a way to sync their priorities before arriving at your house for dinner. Well, there certainly is now. Keep refrigerated., Best before date: see top of pack. Once opened consume within 5 days.